This outfit represents my first attempt at something that resembles an outfit that could be classified as appropriate for fall. I was so excited when the temperatures dipped into the 70s because finally I could justify breaking out a sweater, albeit a short sleeved, extremely thin cotton sweater. (I'll take what I can get.) I saw a similar look pairing this pom-pom dot sweater with a rose print skirt on Respect the Shoes, which inspired me to give my own inspired version a spin. 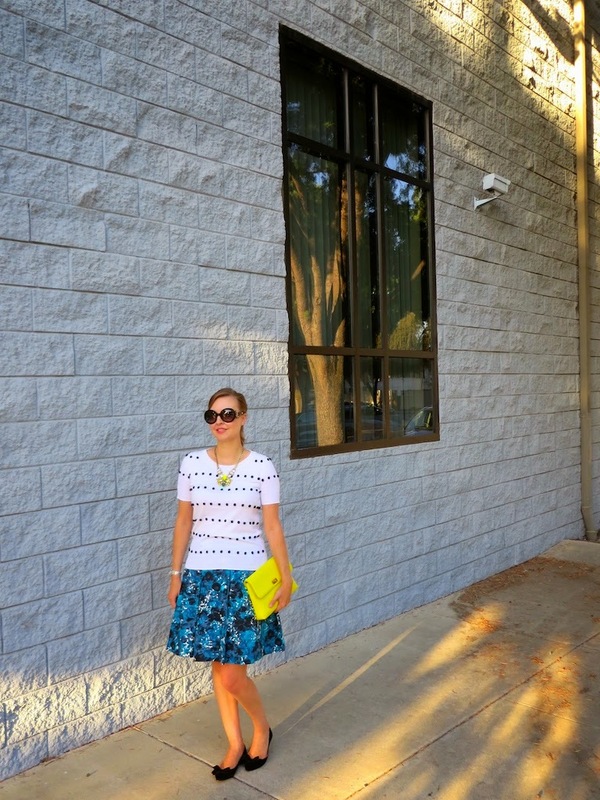 I was happy that in emulating the look I was motivated to dig out this watercolor floral skirt from my closet. I love rediscovering new things in my closet for fall. Even though it's fall and the leaves are turning, you can still give new life to old favorites! Lovely look for in-between days. I adore the sweater, clutch and necklace. You always do color and mix prints, so well!! Thanks! I always enjoy mixing it up once in a while when it comes to patterns. Happy Thursday to you too Ada! I'm just glad that it is almost the weekend! 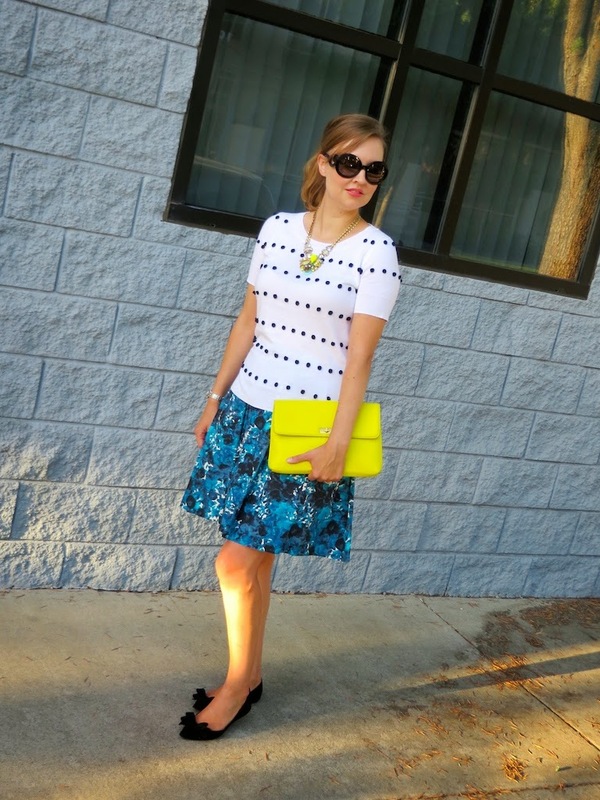 Love the colors and print of your skirt! It's perfect with the pom pom sweater and flats! Such a cute look! Thanks Jill! This skirt is from about 5 or 6 years ago, but I think the pattern looks very much like some of the things coming out for fall. 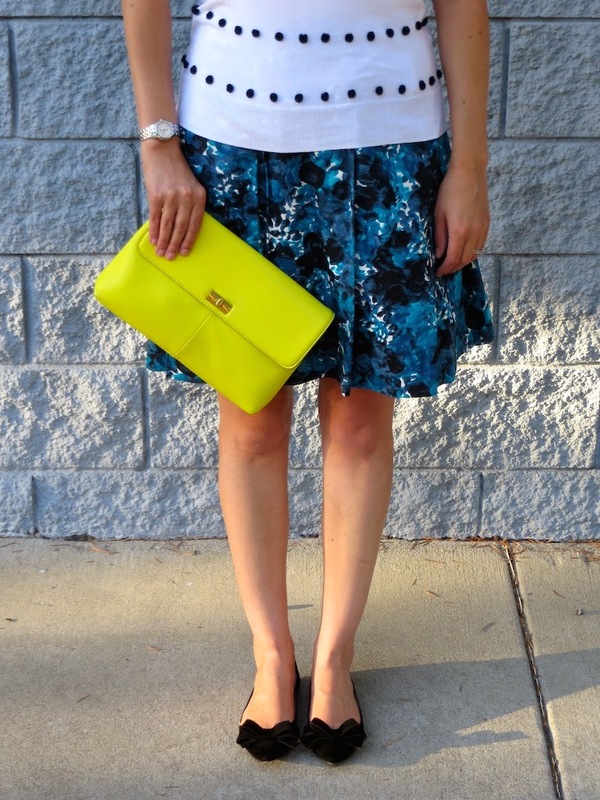 I love how that bright clutch looks with this outfit! What a great skirt! Thanks Laura! I always have to find some way to add in a pop of color! I love the clutch with the more neutral outfit. The pattern mixing here is so perfect too! I feel you about the heat! I can't wait to whip out my button-downs, sweaters and boots! I am so ready for big heavy sweaters and boots... I think we are a long ways off from that kind of weather in L.A. This look is too adorable! Lisa's the best for inspiration! I love this sweater as it goes with so much in my wardrobe and adds just a little bit of something different. Love it! That skirt is "the one that got away" for me. I bought it, but was a poor grad student at the time and thought it was too expensive. I returned it and have been kicking myself for the past 6 or 7 years!! I hate when that happens! I recently spotted a few sellers on eBay asking pretty reasonable prices for this skirt if you still want it. Ebay is always my favorite place for tracking down "the one that got away"!